The most minimalist member of the Ferrosi family, the Ferrosi Windshirt adds durable but light-and-fast wind protection to fall and spring rock climbs, trail runs, and peak bagging missions. Its lone pocket doubles as a stuff sack for storage in your pack. 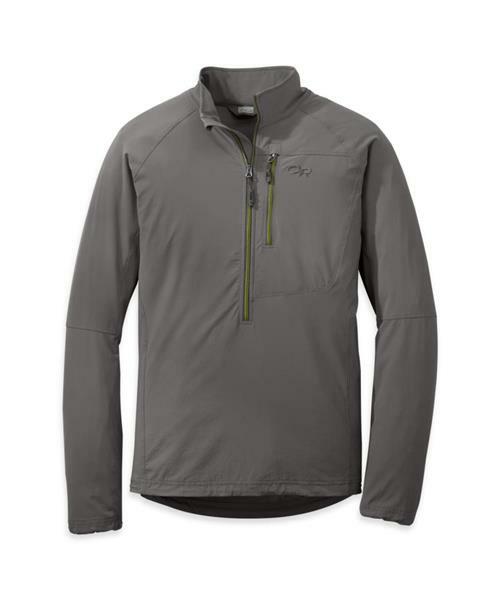 Ferrosi Windshirt - Mens is rated 5.0 out of 5 by 1. Rated 5 out of 5 by Carcajou from Simply the best The OR Ferrosi Wind Shirt is simply the best hiking or backpacking shirt. Unfortunately OR has decided to cease production of this amazing garment. True I have come to use the wind shirt differently than it was designed which is as a mid layer wind blocker. A task it excels at. I believe the addition of Ferrosi garments with hoods and full zippers have doomed the wind shirt. For years I have used numerous tops including long sleeve zip tops made from synthetic, and merino and yak wool. But while I generate plenty of warmth and perspiration! I would frequently be chilled after a heat generating uphill hump or with the arrival wind. One day I decided to try my well worn wind shirt as my base layer. The light weight soft shell material combined with a true front half zip and wrist to near elbow sleeve zips perform magically. The material breathes, dries quickly even when it’s water resistance is overwhelmed. The fabric is generally warmer when damp/wet than typical base layer synthetics or even merino wool. The zips are exceptional at venting and cooling. This year I used my OR Ferrosi wind shirts on a 14 day trekking trip in the Cordillera Blanca range in Peru followed by five days of climbing to over 5700 metres. During the trek we had a full range of conditions- rain, snow, wind, sun and more. For most of the trek it was the only shirt I wore. During the climb I wore it over two other layers and under two more to deal with -15 C and 35-40 km winds. The shirts also performed flawlessly on 5 and 11 day backpacking trips in the Cascades and Canadian Rockies. I also use Ferrosi zip-off pants which also perform exceptionally and are very durable. My expectation is my Ferrosi shirts will perform for years. Thus even though they are no longer made I will have them for years.